Something else to give away, sorry, but you are in luck. We are considering adding "HellFire Wings" and/or may just call them Fire Wings, easier, and they will be a replicate to a demonic type of wings. For moderators and staff, no. It will have unlimited uses. Also, if death allows me, I might make a novelty version of the ban hammer and mute axe, but it won't really have any use. It won't even be a weapon. I think it's a nice idea, however, we have to stick with your word. It must be vanity, and probably rare, in the sense that it is a replica dev item. Also, we are able to ban, tape, mute, and curse with commands. Why not just ask for a Death outfit? One piece which means you'd actually be able to wear head items under/over the hood. We will have a scythe made for public you wear with it at will. Haha, I WILL enjoy terrorizing people as the grim reaper during Halloween. Hopefully game gets released by then. It seems progress is good so far, I've made 90% of the essential blocks. We will add mod items for the Super Moderators when the game comes out. There won't be much for our early mods to do during the beginning, but later, our mods will have to earn their items through good work. Keep in mind that mod items will have a special coding on them, and wont be droppable, and only THAT mid can wear them. If someone winds up changing the values and getting a mod item in their inventory, before we add a patch for that, the items will not be wearable. No point in getting them any way, because they also will not be tradeable, so you can run around saying you have 'em all you want, but you won't be able to prove it. PGO Forum and Game Developer and Admin. If i had to choose a moderator item it would be a death hood. It would be dark, and smoke would sit around the hood, and lead trails when i move around. It would also have red eyes glowing inside the hood. This would be the coolest thing ever! I would have to create it tho. doesn't sound to hard. A quick question, will the moderators in PGO get their own item? Sounds pretty awesome! We can do that for ya. All your ideas are great guys! Mass your Moderator item idea is just like my idea. The terror of PGO oufit! Golden Crown, kings red robe,Ruby staff,Grey beard! Those are two ideas for moderator items I've been thinking about! 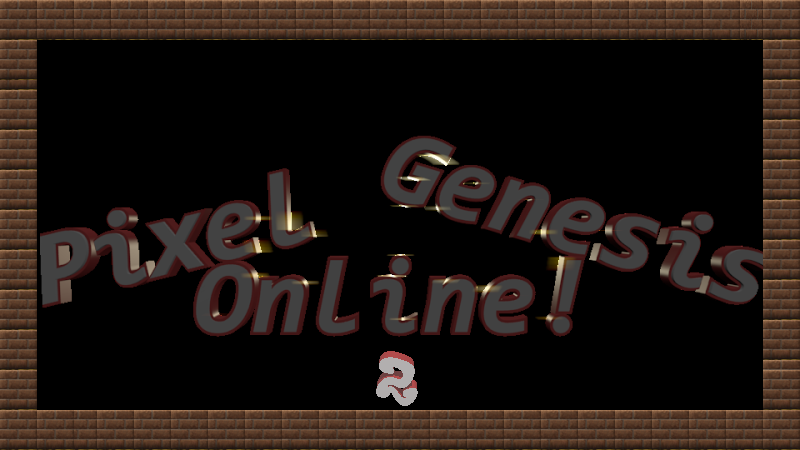 Welcome to Pixel Genesis Online! If you have a question me or anyone else on the moderation team will gladly assist you! Moderators are here to help you. We only punish when a player does something wrong! If you dont want to get punished than before you do anything think twice. Again, megaman helmet through and through. Jaxx's SnapBack. I love hats, especially snapbacks. As far as I know, I am receiving a lightning suit. Detailes are in the development logs. ive seen i love that idea! Hm I figured out my mod item!!!! How about Music Note wings!!!! When I jump there are Music notes that come out of them like the bubble wings on growtopia!!!! nice idea zack, love it! Hmm, I can see in your profile picture that you like music! Have you been in a band while you were in school? My moderator item would still be King Genesis FTW! My mod item would be the shadow wings.. Type of devil wings but dark shadow wings. Subject: Re: If you had your own "Mod" item what would it be?